Healthy nutrition beginners guide: Building our body. What's Protein, and what does it do for us? Which plants are Calcium-rich and what is it good for? Why do we need Iron, and where do we find it in our foods? 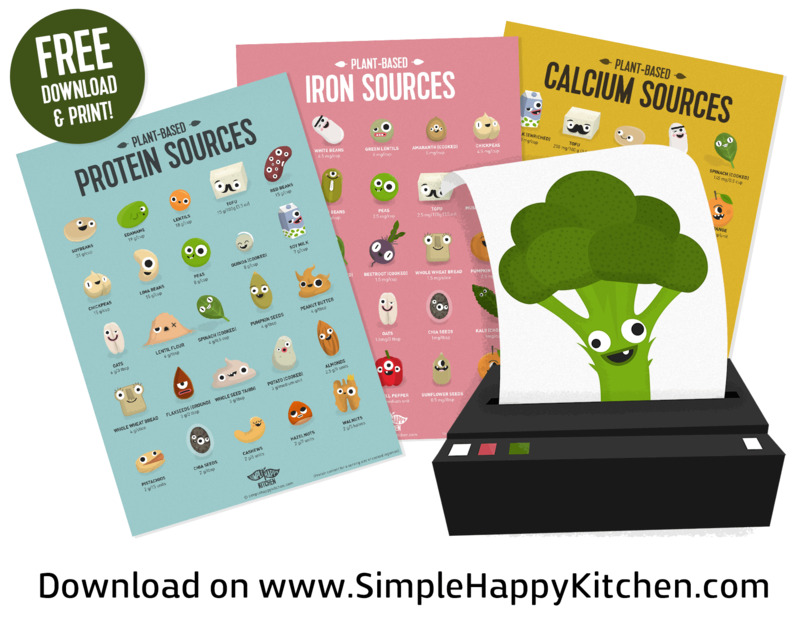 Looking for free vegan protein, calcium and iron printable posters? FREE DOWNLOAD & PRINT POSTERS! Subscribe now and get free high-quality, printable versions of our 3 plant-based sources posters! Protein regulates your body’s tissues and organs, building and maintaining these systems. Almost every food contains Protein, it’s nearly impossible not to get enough if you’re consuming an adequate amount of varied calories. Vegan sources of protein can be found almost everywhere! Calcium is stored in the hard part of your bones and is essential to their health. It also plays important roles in heart action, blood clotting and muscle contraction. No one has to suffer in order for people to get calcium. It’s abundant in collard greens, kale, broccoli, beans, tahini, and almonds. It can also be found in calcium-fortified rice or soy milk and some tofu brands. Learn more about Calcium on the National Institutes of Health website. The proud calcium gang is here! Iron-rich nutrition helps your blood transport oxygen throughout your body and fuels energy-producing processes. Vitamin C helps increase Iron absorption, so for optimal health benefits, consume foods that are rich in both, such as dark-green leafy vegetables or yellow bell pepper which is highest in Vitamin C.
Using our guides for plant-based sources, you can easily meet all of your nutritional needs on a plant-based diet. You can use our Vegan Plate, based on 5 food groups, to plan your meals.